Designation Ltd - 40 years and still going strong! - Air Hose - CHINOOK 2008 - A premium quality, long length moulded air hose for general workshop uses. Made from a special rubber/PVC alloy, this hose handles well and provides a very reliable product at a competitive price. A premium quality, long length moulded air hose for general workshop uses. Made from a special rubber/PVC alloy, this hose handles well and provides a very reliable product at a competitive price. Application Air tools, general airlines, water, temporary ring mains. Standard mandrel built air hose for applications less demanding than for types 1240 and 1220. Also suitable for water. 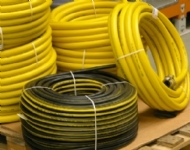 This hose is tough and yet pliable and is available in a good size range. Premium quality medium pressure textile reinforced air hose offering good flexibility and bend radius throughout the size range. Handles well and suited to most compressed air or water applications. High pressure, steel wire reinforced air hose. Also suitable for high pressure water and slurries. This very robust hose would be used on high volume compressors in construction, mines and industrial applications. A hose for use where maximum safety is required. Medium pressure anti-static air hose for general industrial use. Used where electrical continuity is required or when extra electrical safety is required. 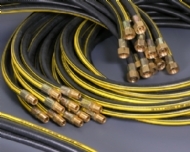 The hose has a high carbon content and fully complies to BS2050.